What is the face in the corner of my Pokemon's summary? There is a face beside the Milotic. What does it mean? I have a few Pokemon in my party with that face. Is it good or bad? I think that face means that the Pokémon is cured of Pokérus. The little face ( ) in the Pokemon's summary means that it once had Pokerus, but was cured of it. If you want to know more about Pokerus, I suggest that you read the Bulbapedia article that my source links to. Yes, that’s what it means. Check your PC for any Pokémon that might still have it, if you were unaware. In a Pokemon's summary, why doesn't it show accuracy and evasion? Is Air Balloon a single use only item like the Gems? Whats the diffrence between gold and blue EVs? Where is Thunderbolt in Pearl (besides the Game Corner)? How can you tell pokemon's happiness in pokemon pearl? 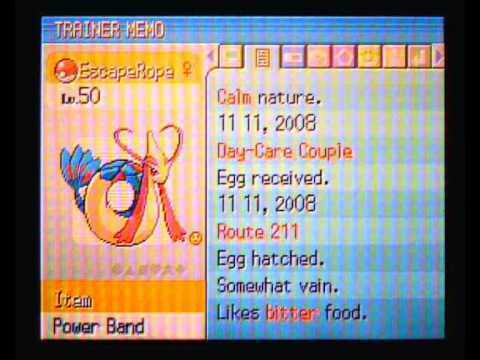 What are the tiny icons in a Pokemon's summary? Doesn't the blue pentagon in a Pokemons summary mean the Pokemon is legit?